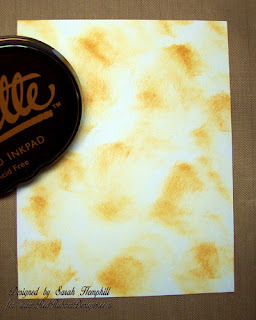 I have chosen Palette Inks in Cognac, Burnt Sienna and Burnt Umber for the demo. The white cardstock has been cut to 5 ½ X 4 ¼ inches. Step 1…Randomly add the lightest color of ink to your cardstock using a sponge or ink applicator leaving some white space. 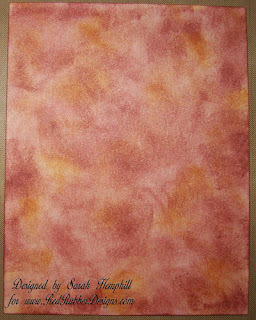 I used Cognac Palette ink. Step 2 …Using your next darkest shade of ink, in this instance Burnt Sienna, apply ink over entire area of cardstock. Step 3…Now you are ready to add your tissue paper. Squeeze the paper into a ball to get lots of wrinkles then open it up. 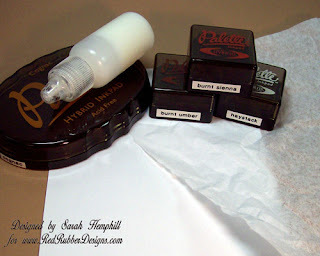 Apply your Mod Podge or whatever glue you have chosen to your inked paper covering the entire surface. 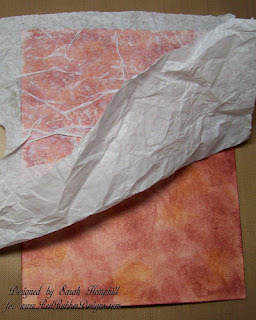 Take your wrinkled tissue paper and lay it on top of the sticky surface of you cardstock. 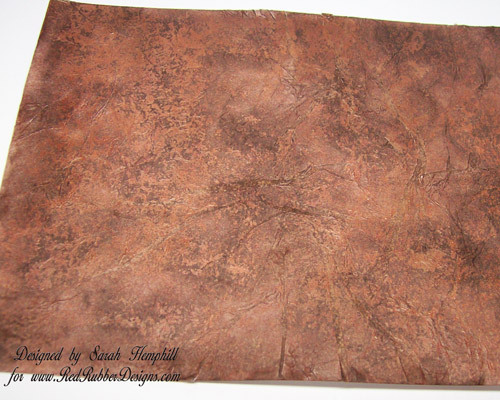 Wrinkles and creases are good and will add to the texture of your finished piece. Let dry thoroughly before proceeding to the next step. You can speed up the drying time by using your heat tool. 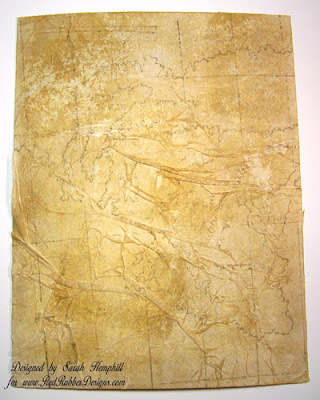 Step 4…Taking your darkest color ink (Burnt Umber) start pouncing the ink over the entire sheet covering all of the tissue that is adhered to the cardstock. There is no need to ink all of the tissue as you will be cutting off the excess. 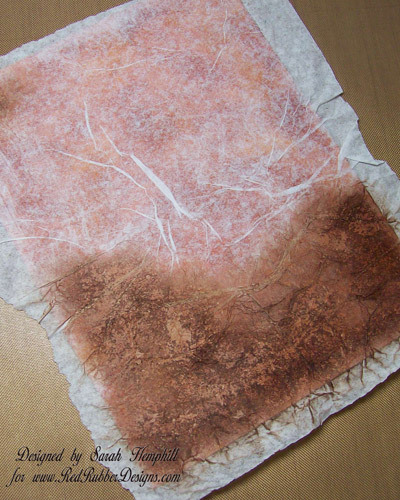 Try not to rub the ink onto the tissue with too much pressure as the moisture in the ink may cause the tissue paper to tear. Trim off the excess tissue. You should have paper that looks similar to this. 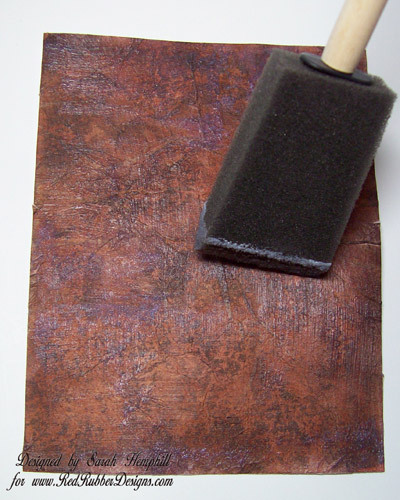 Step 5…Taking a brush or sponge brush, cover the entire surface of your paper with Gel Medium or Mod Podge. You can use either matte or glossy finish. 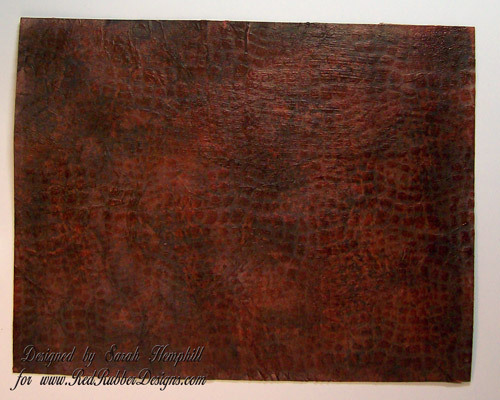 Step 6 (optional)…After my paper was dry, I ran it through my Big Kick with an embossing plate to give it more texture. 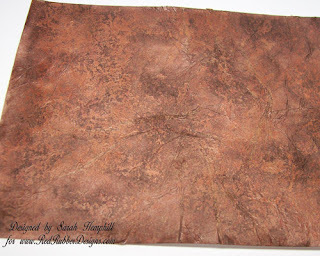 I then ran a Brilliance teardrop pad (Coffee Bean) over the raised areas to give it a little gloss. Here is another piece that I made using Haystack Palette ink as the base color applied directly to the paper from the pad, covered with tissue paper and topped off with TH Old Paper Distress Ink then stamped with the Ancient Map Background rubber stamp from RRD using Charcoal Palette ink. You can download a PDF version of this and all other tutorials for free at Red Rubber Designs. Great technique. I've never seen it done that way with tissue paper and mod podge. I've always made it with Liquid Applique and a brayer. So this is a new way to me. I'll have to try it. Great tutorial. Wow this is amazing! Love it. Awesome tutorial...will have to give it a try one of these days. Great technique, Sarah. I love your finished product. Great technique Sarah, love the effects you have achieved, could be used in so many different ways, love it!! Wow, that really looks like leather! Great tutorial, Sarah! How awesome! The finished product looks amazing!